The Kinda is an innovative bridlewear headpiece that helps reduce poll pressure. It can be fitted with all standard bridles, and features a padded base that increases pressure distribution – the normal bridle headpiece threads through a hidden channel at the top of the Kinda, for a smart, smooth appearance. The Kinda is ergonomically designed for a comfortable fit at the ears. 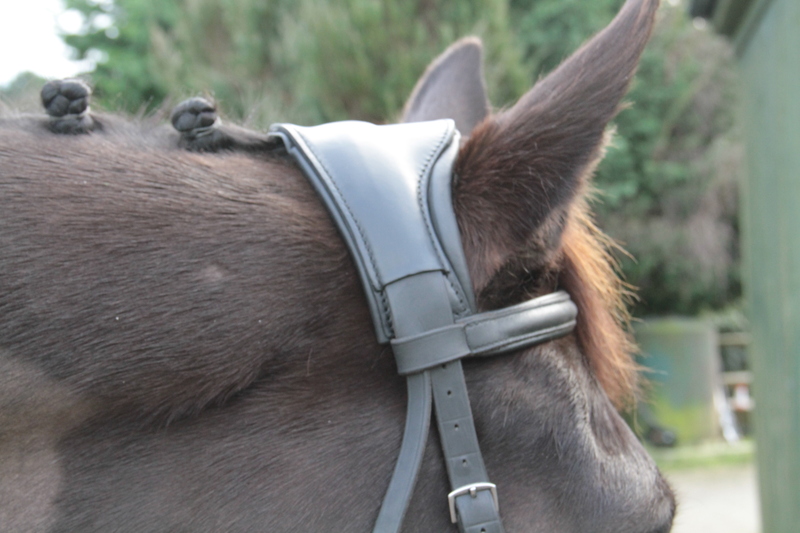 The product also helps to alleviate pressure from the ‘bridlepath’ section of mane behind the ears, which with a bridle headpiece on top, can cause discomfort. The Kinda has a channel running beneath it, like a saddle gullet, in which the trimmed section of mane can sit. The Kinda may also help prevent headshaking in horses that are sensitive to pressure at the poll and ears, and is useful for horses with big ears, whose headpieces are prone to pinching. Bridles can be an issue, and if ill fitting, can affect performance. Ideally, pressure under the headpiece should be distributed over a wide area, rather than focussing on the sensitive poll area at the top of the horse’s head – particularly if a bit with leverage action is used! It is highly likely that perceived equine behavioural issues such as being head-shy, or head-shaking, are linked to head discomfort – consider a bridle product that increases pressure distribution by utilising a wide padded base at the head piece, if your horse is sensitive. Try bridles that are ergonomically designed for a comfortable fit at the ears, and beware of keeping a ‘bridlepath’ of hair for the bridle to sit on, unless you can keep it very short – because a ‘stubbly’ bridlepath can cause discomfort and pressure. 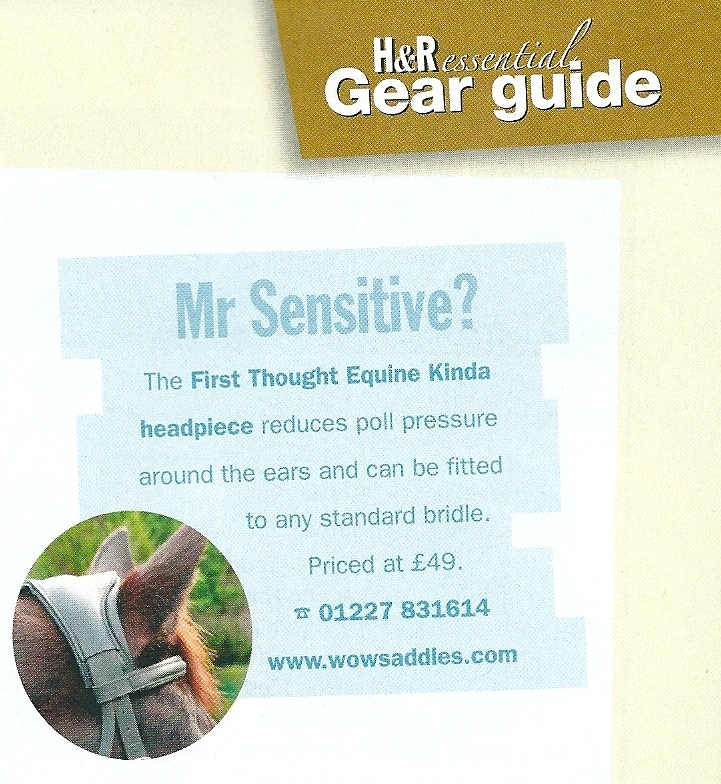 WOW saddles has recently launched an innovative bridlewear headpiece called the Kinda that helps reduce poll pressure. It can be fitted with all standard bridles, and features a padded base that increases pressure distribution – the normal bridle headpiece threads through a hidden channel at the top of the Kinda, for a smart, smooth appearance. The Kinda is ergonomically designed for a comfortable fit at the ears. It also helps to alleviate pressure from the ‘bridlepath’ section of mane behind the ears, which with a bridle headpiece on top can cause discomfort. The Kinda has a channel running beneath it, like a saddle gullet, in which the trimmed section of mane can sit. The Kinda may also help prevent headshaking in horses that are sensitive to pressure at the poll and ears, and is useful for horses with big ears, whose headpieces are prone to pinching. The Kinda is only £49 and is available in Black or Brown. Call 01227 831614 for stockists of the Kinda. 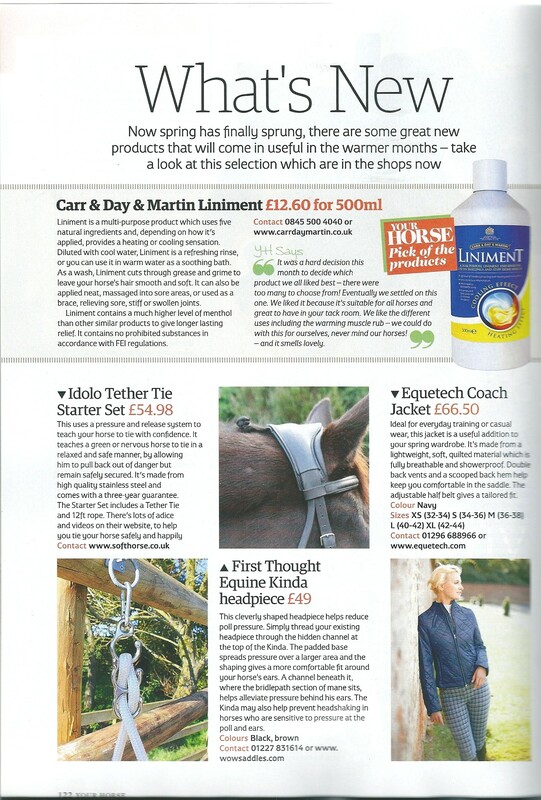 We are pleased to see The Kinda featuring on Horse & Hound website. The Kinda can be fitted with all standard bridles, and features a padded base that increases pressure distribution. The normal bridle headpiece threads through a hidden channel at the top of the Kinda, for a smart, smooth appearance. 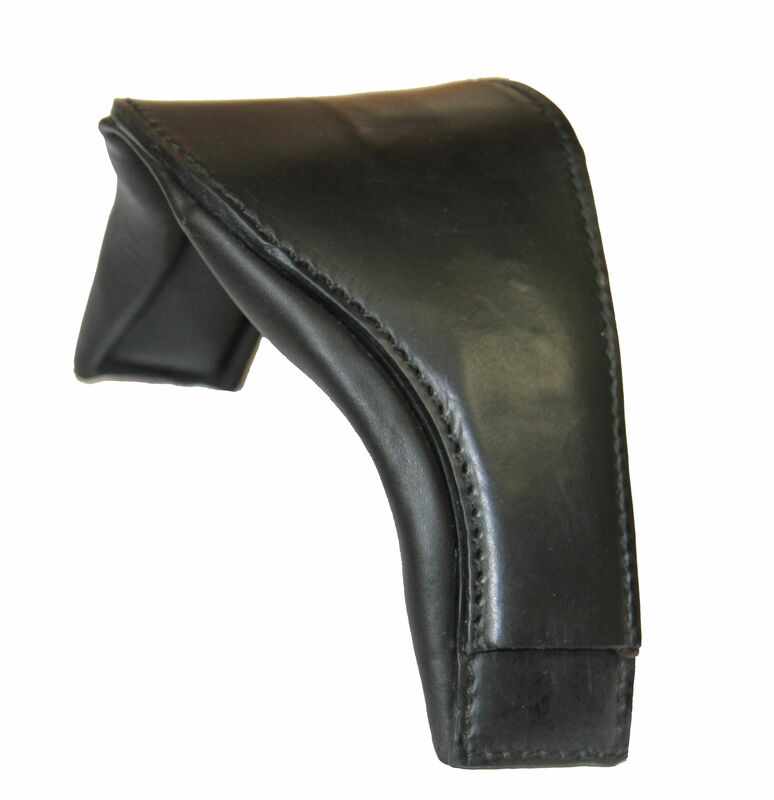 It is ergonomically designed for a comfortable fit at the ears. “The product also helps to alleviate pressure from the ‘bridlepath’ section of mane behind the ears, which with a bridle headpiece on top, can cause discomfort,” said a spokesman for the company. The Kinda retails for £49 and is available in black or brown. 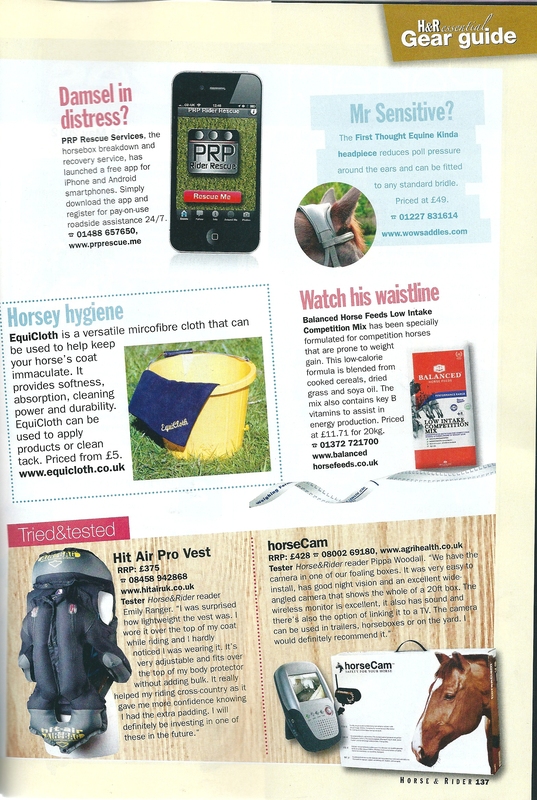 The Kinda can be found in the current issue of Your Horse magazine, which is available from all good national retailers.We are pleased to feature in the What’s New section. The Kinda can be found in the current issue of Horse and Rider magazine, which is available from all good national retailers. We are pleased to feature in their essential gear guide section. First Thought Equine are launching their new bridlewear headpiece – The Kinda.